Attended an event held by the BBC Trust last week which basically took the form of a series of mini-debates among bloggers. 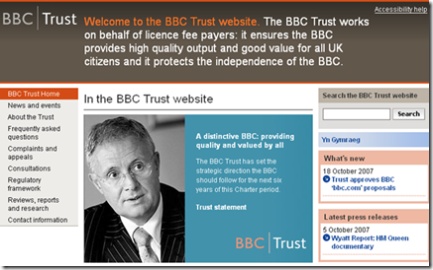 ...works on behalf of licence fee payers: it ensures the BBC provides high quality output and good value for all UK citizens and it protects the independence of the BBC. First off it was was just great to meet up with some fellow-blogistas, like Sunny from Pickled Politics and Simon Dickson to name but two. One point came back to me again and again. I even related the tale in a couple of meetings, and I suspect it will become a favourite illustrative anecdote. Someone from the Trust opened up the proceedings by asking us not to dwell on two topics of conversation which were outside the remit of the review: (1) the controversial BBC iPlayer and (2) the editorial impartiality of the BBC (especially the news). Then Mark Rogers from Market Sentinel stood up and gave a brief overview of conversations in the blogosphere. Naturally I took a keen interest in this as researching conversations and communities online is a fairly important part of my business. Mark very eloquently summarised the main two topics of conversation about bbc.co.uk in the blogosphere as being about... wait for it... the iPlayer and the perceived editorial independence or otherwise of BBC news coverage. He added that these topics were sometimes "proxy discussions" for other topics such as whether the BBC should exist at all, or for parochial political discussions. It was a brilliant analysis, and it immediately challenged the idea that the Trust could define what subjects it wanted to have a conversation about with its networks. It's a challenge that are a lot of policy makers, politicians and public sector organisations are going to come against increasingly. You can't set the agenda in a network. You can encourage, initiate, influence and invite, but you can't ignore what's there or you will disqualify yourself from the most important conversations, discount your usefulness, mark down your relevance and even your legitimacy, ultimately. 1. It was a brave experiment to put this may opinionated blogging types in a room together: David Wilcox did a great job in making this happen and was clearly acutely aware of the issues around blogger outreach. Although I'm basically favourably disposed to the BBC as an institution, I'm highly allergic to committees and get nauseous if I catch a whiff of bureaucracy, so I did approach the evening with some trepidation. What I saw was an organisation willing to open up. The openness and by definition unregulated nature of the blogosphere makes it an alien and even hostile space to your average regulator or trustee, I'm sure. So well done them for even going this far. 2. The shift from channels to networks means that the concept of governance must be challenged and reassessed: Power is shifting out (not down, as some condescending types out have it) from large organisations. The BBC Trust needs to understand the nature of this change, of the shift to networks, and be clear (to itself first of all) about what that might mean for its role. The opportunities to involve and engage with the people that pay for and use the BBC and the organisation are increasing - and it's about more than just engaging with the "blogosphere". In short the Trust needs a strategy for responding to the media and social revolution going on around it. Social media is not just another channel for consultation and governance as usual. 5. Governance / public consultation needs to be *live* if it is to be relevant today: It's neat and tidy to carry out a one month consultation with stakeholders, but it is limited. People interested in all sorts of aspects of the BBC on and offline are offering their thoughts all the time. To remain relevant, and indeed legitimate, I would say that it was in the Trust's and all our interests that listening and engaging with their publics was something that was happening all the time. The BBC Trust should be thinking about a retainer for Market Sentinel, or developing their listening skills and process networks in-house. Anthony - thanks for the kind words, and even more for such a thoughtful piece. I was working with Lizzie Jackson and Ed Mitchell on this project for the Trust. As you say, it is really difficult for what are inevitably bureaucratic organisations to step into the networked world. We found the Trust keenly aware of these issues, and prepared to spend some time planning this cautious first step. It is of course up to the Trust to decide how to follow through in this case - but I do strongly agree in general with your points about continuing process, and governance. It is an issue that will (I hope) break out in lots of other situations, including membership organisations. It is I think worth drawing a distinction between the interests and desires of the most vocal bloggers relating to the BBC and those of bloggers more generally. I wasn't able to be at the meeting alas but it sounds (perhaps unsurprisingly) as if it is primarily 'elite'/policy-wonky bloggers who were invited to participate. I would encourage the Trust to look more widely at all of the varied uses of blogs that might be BBC relevant. What about the BBC reaching out to the blogs run by avid fans of individual shows? Or engaging with topic-specific blogs before or after doing factual/current affairs programmes? David Brake: Brilliant comment - thanks. I'm sure there were some wonky and some elitey bloggers there, but not all by any means. I think it was a good first step by the Trust. I agree completely about topic specific and fansites - and I made a point on those lines during the open debate - using food bloggers as an example. Engagement - listening and blogging should definitely be encouraged by all programme makers, producers, commissioning editors etc - it would bring them closer to their most important communities and enrich the programme-making process I'm sure.